Just when you thought the internal combustion engine was dead, Ford engineers produce a 1.6-liter diesel engine that blows away the fuel-efficiency marathon record with an astounding 90.65 mpg in a Ford Fiesta. The record was set at the respected Fleet World MPG Marathon event that was recently held in the UK. 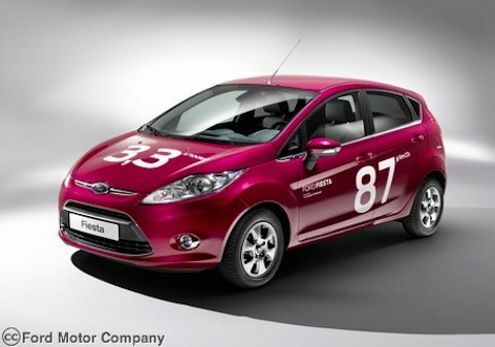 The Fiesta with ECOnetic Technology used just 16.22 liters (4.28 gallons) over the 624 km (388 mile) course. The marathon takes the competitors and their cars over public roads “through tricky conditions” in south Wales and the Cotswold region of England. The record result was set during the 2012 ALD Automotive/Shell FuelSave MPG Marathon, and was organized by Fleet World magazine in the UK. The diesel powered Ford Fiesta went up against competition including the Toyota Yaris Hybrid, Fiat Panda Multijet Easy, Volkswagen Golf Match Tdi 105 and Kia Rio 1.1 CRDi 1 Eco. The driver used Eco-driving techniques, and the results were 21 percent lower than the official fuel-mileage ratings. But the results still come from real-world driving conditions on public roads. “Eco-driving techniques can massively lower your fuel consumption in any car, but to reach such levels you need a car designed for the job, and Fiesta ECOnetic Technology certainly is,” said Andreas Ostendorf, vice president Sustainability, Environment and Safety Engineering, Ford of Europe. ECOnetic Technology brings together a range of new fuel-saving technologies. It starts with Fords new fuel-stingy 1.6-liter TDCi diesel engine. Diesel engines have always been known to be fuel-efficient and Ford’s new engine technology is proving they are here to stay. European automakers has been using diesel powerplants for decades and have been hugely successful in powering their cars. Other ECOnetic Technology features on the marathon-winning Ford Focus include Auto-Start-Stop, Smart Regenerative Charging, Active Grille Shutter, EcoMode, Gear Shift Indicator, bespoke engine calibration and optimized gear ratios with a six-speed transmission. The Fiesta also gets a lower suspension, wheel deflectors and low-rolling resistance tires that reduce friction from the air and road. The Ford Fiesta also incorporates special underbody shielding making it highly aerodynamic. While most drivers won't achieve the kind of mileage the marathon vehicle produced, the Ford Focus with ECOnetic Technology still gets impressive fuel economy of over 70 mpg. The Ford ECOnetic Technology will also be put in the new Ford Focus which will go on sale across Europe this month. The 2012 Ford Fiesta is already Europe’s number one selling small car, and when Ford of Europe’s most fuel-efficient passenger car hits showrooms, it may move the small diesel powered car to the top of the list. Let's hope Ford brings the fuel-stingy diesel to the U.S.
That car will never make it to the U.S.. It will never meet the EPA's diesel emissions regulations. which is stricter than those in Europe and the UK.